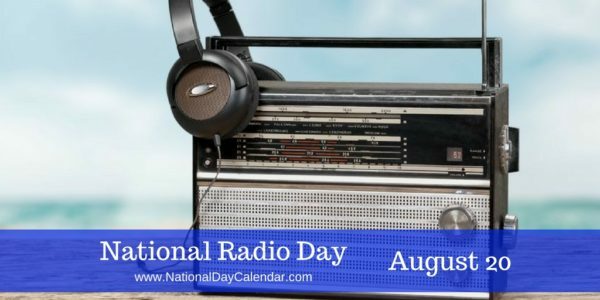 Each year on August 20th, National Radio Day recognizes the great invention of the radio. In the late 19th century, it became clear that wireless communication was possible. Several inventors had a part in the invention of the radio in the late 1800s and not just one person can be credited with its beginning. To make the radio a reality, it required several different inventions and discoveries including both transmission and reception methods as well as technology. In fact, the radio’s inception required an international effort. The research of German Heinrich Hertz proved electrical could be transmitted wirelessly. The multiple patents of the prolific inventor Nikola Tesla provided the radio with the Tesla coil. Born in Croatia, Tesla also contributed many patents involving alternating current advancing the science and production of numerous inventions. When it comes to the first commercially available wireless, Guglielmo Marconi receives the honor. Before wireless became a function of music and entertainment programs, the wireless radio served more of a military and a regular public service role. Much like the dits and dots of a telegram, the wireless transmitted information. On board the Titanic at the time of its sinking, a Marconi wireless was in use. However, in 1906 The first radio broadcast of voice and music purely for entertainment purposes occurred. Reginald Fessenden transmitted the program from Brant Rock, Massachusetts for the general public to hear. The Canadian born scientist would go on to many more successes in his lifetime. Another contributor to the radio was American, Lee de Forest. Born in Iowa in 1873, he would become the chief scientist for the first U.S. radio firm, American Wireless Telephone and Telegraph. Lee de Forest’s invention of the Audion vacuum tube made live broadcasting possible. As wireless came alive, the first broadcast stations began airing programs in the 1920s. News and world events were the first items over the airwaves. On October 1, 1999, the first satellite radio broadcast occurred. Worldspace aired the broadcast in Africa.